The multi-faceted artistry of Bay Area bassist sensation and composer, Edo Castro, elevates the sounds that come from his unique, multi-stringed basses, both fretted and fretless, into a palate from which intricate compositions flow. Castro describes his newest release, Sacred Graffiti, as a tapestry of emotive impressions. These dynamic visuals have been given auditory life as Castro delivers intricate urban jazz arrangements interspersed with immersive soundscapes where the tangible tension between inner and outer worlds is encompassed by grace. Special guests – Mark Isham, David Friesen, Michael Manring, Dan Zinn, and Percy Jones, among others, join Castro on this endeavor. He offers this CD as his Sacred Graffiti on this website. Influenced by flautists Paul Horn, Herbie Mann and Rahsaan Roland Kirk Eric Evans chose the flute as his lead instrument. Eric has been a featured performer at a wide array of concerts, venues and churches in Southern California, Northern California, New Mexico and Arizona. 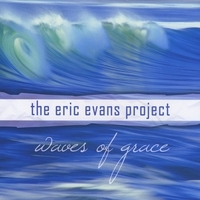 After Eyes Of Love and Compass Waves Of Grace is Eric’s third installment. Musicians on the new album are Eric Evans (flute, alto flute, EWI), David Eugene Ivey (vocals, acoustic guitar, keyboards), Cecil Ramirez (keyboards), Brent Bourgeois (keyboards, vocals), Steve Laury (electric guitar), Lance Taber electric guitar, acoustic Guitar), Curtis Harvey electric guitar), Michael Roe (electric guitar), Ralph Stover ( drum programming, bass), Eddie Ramirez (bass), Matt Sawhill (bass), and Bruce Spencer (drums). Three years in the making against all odds Eric fulfilled his dream. He looks now Seaside enjoying the fresh breeze. Impressing with the beautiful sound of his flute is his mission. Colors And Light is the name of a fantastic musical and human adventure of a band . This is also the name of the song. It has been founded by Francois Quillet in 1990 with most talented French musicians Sega Seck (der) Daniel Solia (Dr) Frederic Monino (Bs) Pierre Diaz (Sax) Jean Marie Frederic (Guit) . Then in 1993 it has been restructured with Samuel Devauchelle (Dr) , Jean Bertrand Carbou (Bass) , Alex Auge (Sax) from the Band REGLISS and the beautiful and amazing voice of Christine Flowers . The CD Pacific is a collection of amazing and original melodies, also the result of an international adventure gathering fantastic artists as Mike Porcaro (bass), Oscar Cartaya (bass), Francois Quillet (Piano, Keys), David Herzhaft (Harmonica), Samuel Garcia (Accordeon), Ross Hogarth (Sound Engineer) and years of perseverance. Listen to this recommendable album at CDBaby. Detroit native Tim Bowman‘s first steps into popularity was his work as musical director and lead guitarist of the group The Winans. While Gospel was his first love, he found his home in the smooth jazz genre. Albums like Love, Joy, Peace (1996), Paradise (1998), Smile (2000), This Is What I Hear (2004) and Tim Bowman (2008) were milestones of his path to success. The Tim Bowman Collection is a retrospective of Bowman’s musical career added with three brand-new tracks. The album starts with Let It Shine, a result of Bowman’s collaboration with hit maker Darren Rahn, who recently was Talk Of The Town. The introduction into Bowman’s collection is naturally crowned by his excellent guitar performance. Smile is taken from his same-titled album featuring legendary saxophonist Dave McMurray. Dave has already finished the recording of his new album and is currently touring with Bob James or Kid Rock. A mellow tune about the good relationship between human beings and God. Summer Groove from Bowman’s album This Is What I Hear is a kicking melody and a good choice for today’s return on our turntable. Great guitar licks in the style of George Benson are accompanied by Nelson Rangel on sax, while Tim Bowman jr. hums the song. The horn the music the sound of Marcus Williams, experience a new style of smooth jazz and funk fusion on Marcus’ new album, Secrets. Listeners get silky soulful vocals fused with his sensual muted trumpet. Add to this mix, his signature jazz, R&B flavor and the result is a CD likely to please any smooth jazz fan. The multi talented composed, performed and arranged the who CD, recording we done in his private studio in Bali Indonesia and the brilliant CD cover was created by none other than Ika at Ikaart & designs. The featured song “Sit Beside U” Has become an hit with smooth jazz fans garnering more smooth jazz radio play! Touch me is also a major favorite with the jazz audiences and has been feature on several smooth jazz stations. Marcus is a one of a kind artist, he has the ability to find just the right production that fits for his style and can create this from top to bottom alone! He knows what he wants and he does his thing and makes it come to life. He is truly an amazing artist! If you are a jazz lover and you are looking for a fresh sound then this CD is for you. Now available at the M-Tunes store as a CD or CD Download. For more information visit the artist’s website. Coming off of back to back #1 records, master class/feel good guitarist Tim Bowman makes his triumphant return to the fold and digs deep into his body of work to release Collection, a riveting showcase of some of his finest sides, highlighting the unique depth of this new class, contemporary jazz and gospel superstar. This beautifully packaged assemblage of all that is Bowman is a feel good ride of pure pleasure. With the addition of new music and his highly sought after classic ‘Summer Groove,’ Collection should prove a must have for his hungry and passionate Jazz and Gospel base, and spawn a brand new legion of Bowman lovers. He is the internationality in person. Born in Nigeria Greg Manning grew up in Switzerland. In 2002 he moved to Los Angeles but still keep contact to the land of his youth. So he is a three-time certified platinum producer for Universal Music Switzerland, and has had several Swiss Chart toppers since 1996. Greg worked as musical director with Jonathan Butler and also performed with Brian McKnight, Kirk Whalum, Will Downing, Richard Elliot, Gerald Albright, Chante Moore, Mindi Abair and Keb’ Mo’ just to mention a few. His debut album Soulciety was released in 1999 and is unfortunately unavailable anymore. By chance I became aware of his new album The Calling, which was released in April 2010. Greg’s new album features Mindi Abair, André Berry, Patrick Bettison, Tom Evans, Keb’ Mo’, Jimmy Reid, Kirk Whalum and Terry Wollman among others. Greg wrote, arranged, mixed and produced all songs except Nick Of Time.